The only alternative to traditional flares. There is no expiration date or hazardous disposal concerns. Most importantly, it is safe and easy to operate with no danger to persons or vessel. Unlike hand flares, this light can be operated unattended. Secure it aloft or on to the cabin top and deal with the emergency at hand. 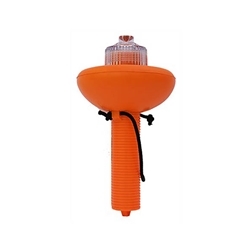 USCG compliant for day and night use when carried with a daytime distress signal flag (included). This LED light flashes up to 60 hours on 3 C-cell batteries. The patented lens shines horizontal and vertical beams. Flashes only the SOS sequence per USCG regulations. Floats, lens up. Waterproof and submersible. Measures 8 1/2" x 4 1/2"